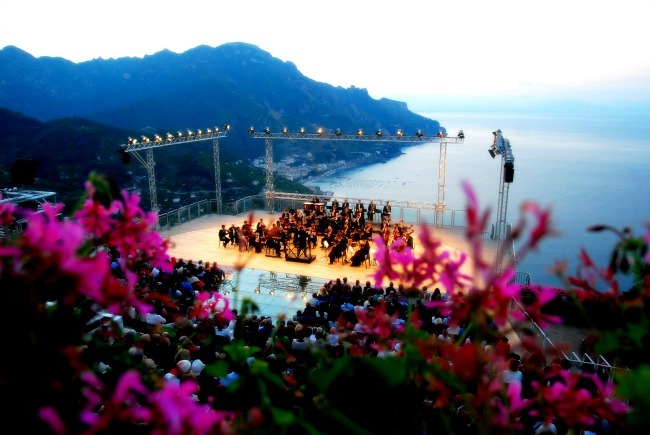 The stage is set, the lights are ready, the gardens perfectly manicured and the 2014 Ravello Festival is ready to begin! With the spectacular Amalfi Coast and Bay of Salerno as the backdrop, many performances will take place in the Villa Rufolo on a stage that seems to cling dramatically to the very edge of the mountainside. 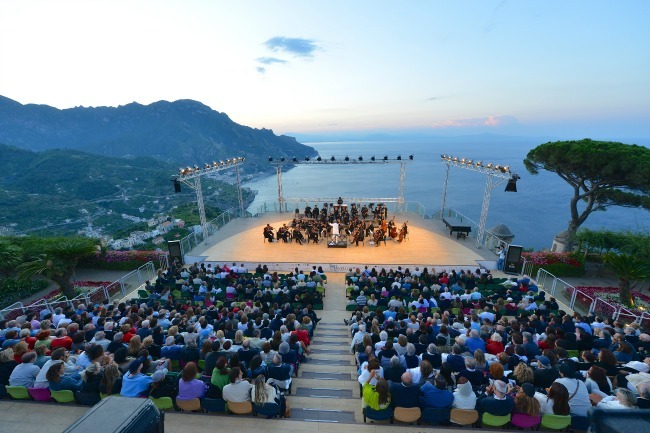 This specially built stage, along with the modern Auditorium Oscar Niemeyer, will host another outstanding series of concerts and events for the Ravello Festival 2014, which runs from June 21st to September 20th, 2014. This season brings luminaries from the world of music–of a wonderful variety of genres–theater and dance, along with events with writers and artists from around the world. 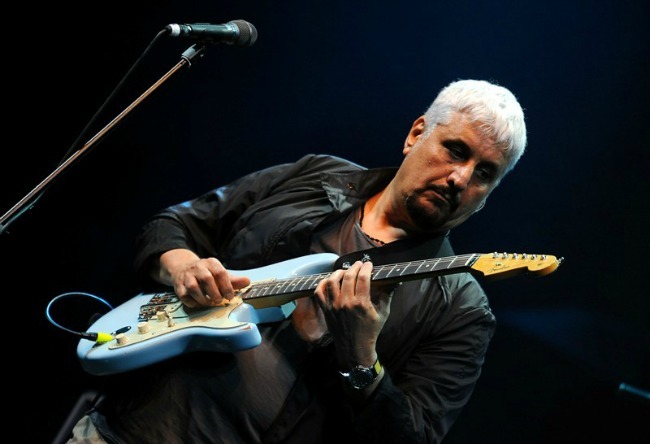 Highlights of this year’s Ravello Festival will be the already sold out show by Italian musician Pino Daniele, along with performances by Chick Corea and Stanley Clarke, Chrysta Bell, Burt Bacharach, the Kronos Quartet, Chanticleer and the Orchestra del Teatro “Carlo Felice in Genova for the stunning Concerto all’Alba held as the sun rises over the Amalfi Coast. Each spring I look forward to the publication of the Ravello Festival program of events to see what will be on. We attend at least one show each summer, but this year was a tough choice with all the great options! 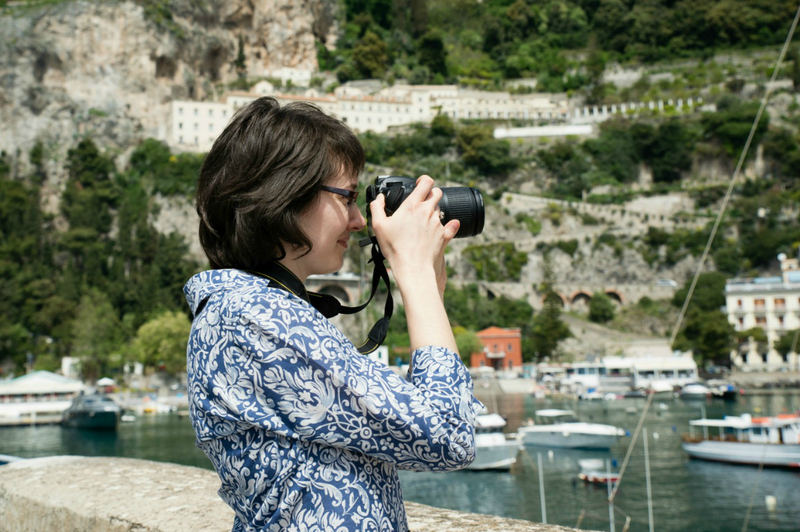 If you’ll be visiting the Amalfi Coast this summer, I highly recommend checking out the Ravello Festival program and booking your tickets in advance. They have a Box Office right by the entrance to the Villa Rufolo in Ravello or you can find out how to book tickets online here. It’s an incredible feeling walking through the entrance of the Villa Rufolo for a concert. The gardens are an enchanting setting for art of any kind, and this year they also host an exhibition of work by British artist Tony Cragg. Arriving for the concern, you can stroll through the gardens, admire the cloister with its intricate arches and find your seat overlooking the stage and the sea beyond. With lights twinkling along the coastline, the artists and musicians take center stage. Visit the Ravello Festival website for more details on concerts, events and booking tickets. 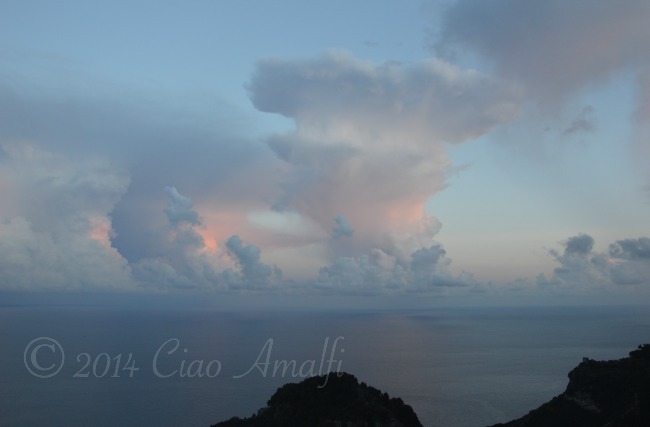 I hope you’ll be here this year to experience the magical setting of Ravello and attend the Ravello Festival 2014! Um, so just where is centro? This week I’ve finished up a massive writing project that has kept me even busier than usual of late. It felt good. It felt very good! But now that things are settling back into the normal level of busy, it’s time once again to focus on balance and recenter. 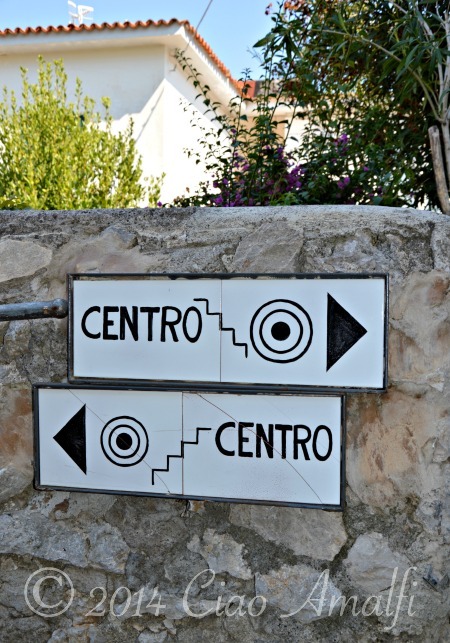 Lately life has felt a little too much like this funny sign in Ravello pointing to the centro in opposite directions – and each way with steps. Well, it turns out both pathways do lead back to center of the village. One way has more steps than the other, but I’m not going to tell you which one. That seems to be the thing with life. Sometimes you get stuck on that pathway with way more steps than you might feel like climbing. My life motto: Bring your camera and enjoy the view! The weather has been dramatic this week with sudden thunderstorms several times a day followed by blue skies and the sunshine peeking out. 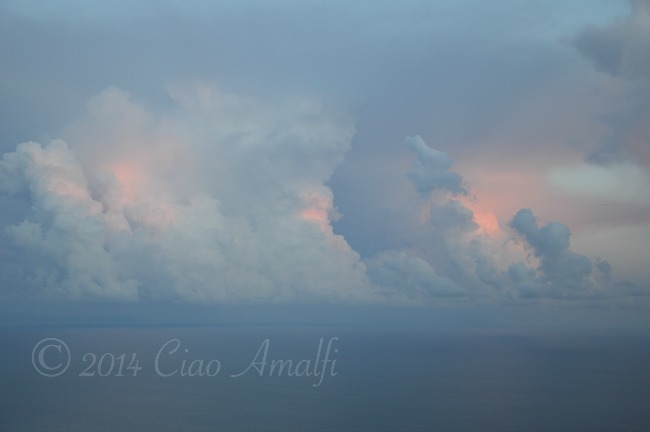 Yesterday evening at sunset another storm rolled in from the sea. But just before it arrived the sky was full of the most spectacular clouds. 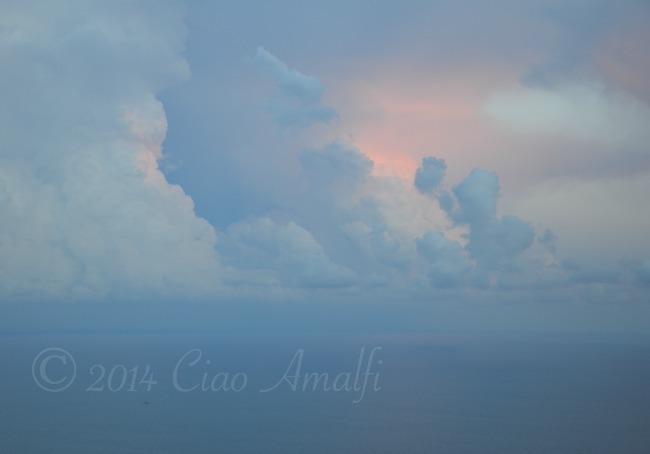 It was a majestic moment with the clouds tinged ever so slightly pink and lightening flashing over the sea in the distance. 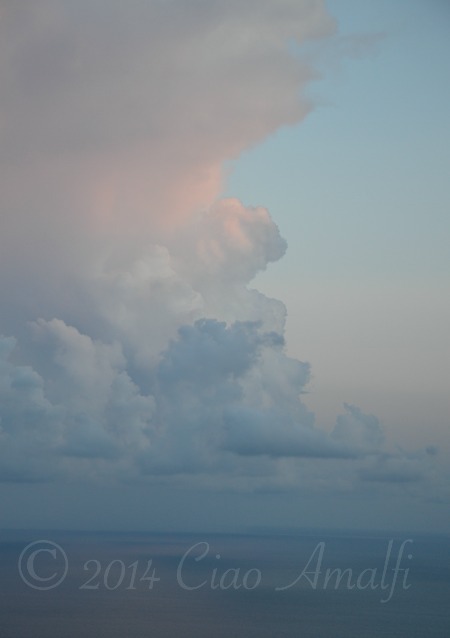 The layers of clouds, the different textures, the subtle colors and the rumble of thunder. It wasn’t long before the sky darkened and the storm arrived. The grumbling storm and pouring rain stuck around most of the night. This morning the skies were clear again, but as I type I can hear more rumbling coming over the mountains. The weather forecast predicts nice summer weather to return very soon. 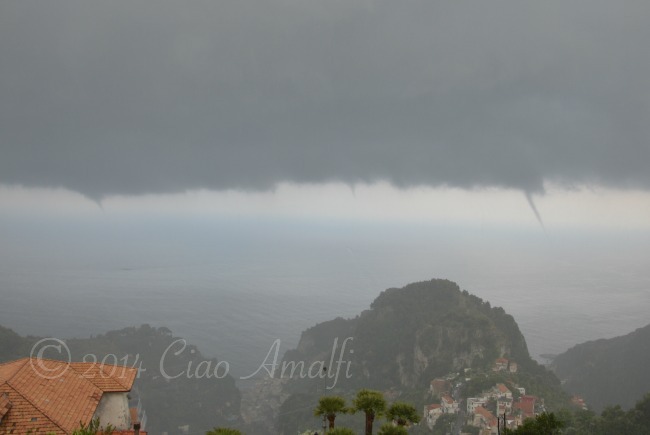 Nature has put on quite a show this week on the Amalfi Coast! From blue skies and beach weather to thunderstorms and waterspouts. I guess that’s just the unpredictability of early summer for you! 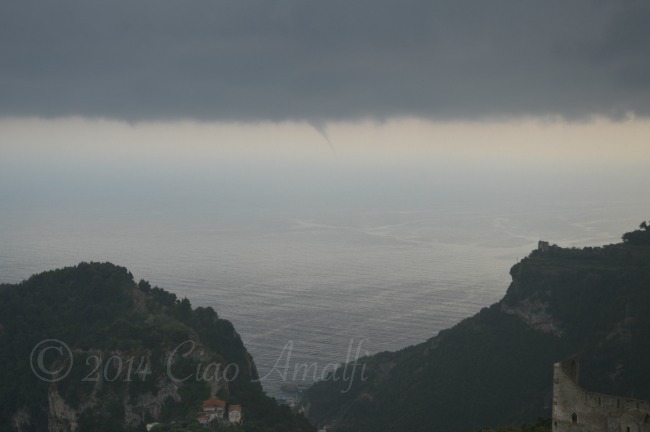 On Sunday the weather turned suddenly quite bad in the late afternoon with lightening, massive thunder that rolled through the valley and the rather unusual occurrence of waterspouts. The first one I spotted was the tiny one above, but I could see there were more. At one point there were three that we could see, but mostly they were quite small. 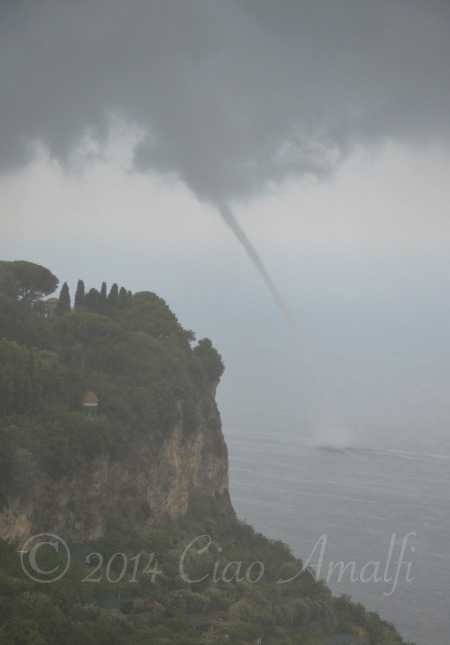 The waterspout in the photo above was the largest, but it only lasted a few minutes. It was at the peak of its strength when I took that photo, but by the time I turned the camera and refocused to take a horizontal shot it had already disappeared. Sunny skies or dramatic storms, this coastline is always stunningly beautiful. But I know everyone on holiday would much prefer the beach weather, so here’s hoping the nice weather returns soon! 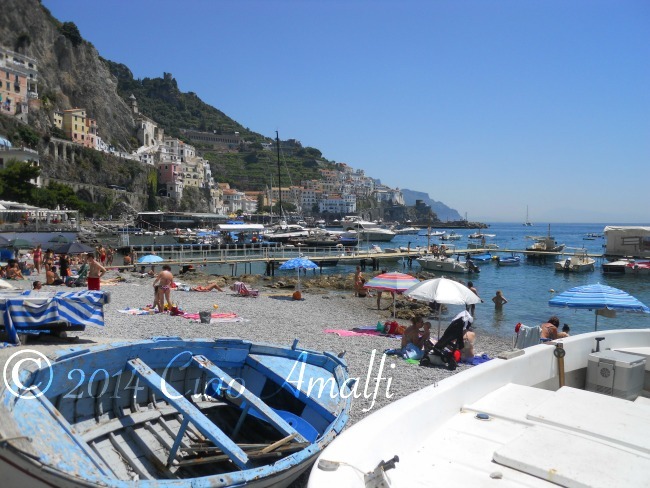 Summer has arrived on the Amalfi Coast! The first half of June has been unusually warm, which has the beaches busy and sunbathers happy. Dig out the flip flops, swimsuits and towels. It’s time for the beach! I didn’t make it to the beach until last weekend, a tad behind many of the locals and a lot of the tourists. But there’s a right time for everything, and that time was last Sunday. The sky was clear, the sun was hot and there was a slight breeze from the sea – the perfect beach day! Since we hadn’t been in the sun much yet we just wanted to take a quick swim and get that first sun without burning. (Well, me burning. My husband tans in about 32 seconds and doesn’t burn.) 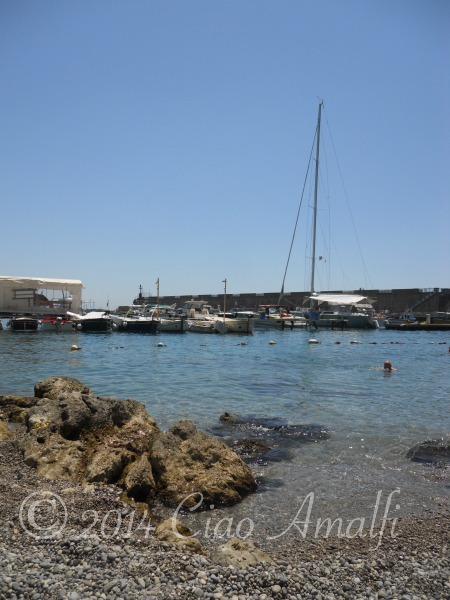 We had planned to go to the larger Marina Grande beach, but were stopped in our tracks by the clear, tranquil water at the port. There weren’t very many people either. We found a spot for our towels right by the edge of the water and the view was lovely. The mast of one sailboat soared above all the other boats moored in the harbor. 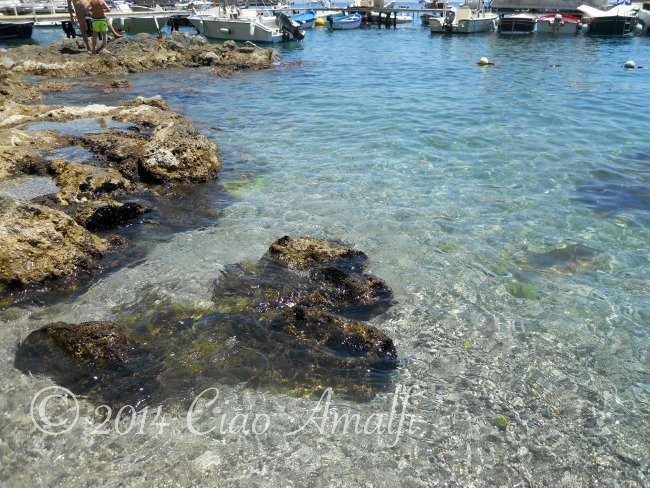 Since the temperatures just warmed up a couple of weeks ago the sea is still pretty chilly. I was able to wade in quite a bit, but chose not to make the full plunge. The little girl that ran into the water with a big splash only to pop up a moment later and scream, “Aaaaaah it’s freezing save meeeeeee” wasn’t particularly encouraging either. 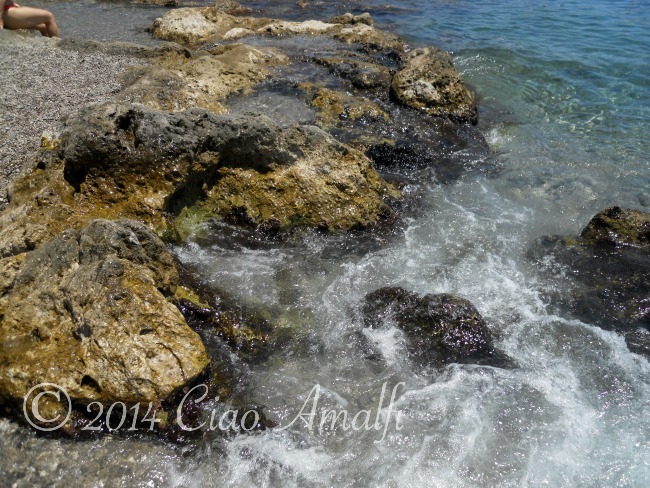 So I attended to my normal beach activity of watching the waves rush through the rocks, enjoying the sun sparkling on the sea and taking photos. While I’m not an overly cautious person, I do appreciate the fact that to date no one has had to save me from any of those activities. That was followed by a particularly noble attempt to lay in the sunshine and do nothing. I’m way out of practice there, so that lasted about 5 minutes before I remembered I had grabbed a magazine on the way out of the house. 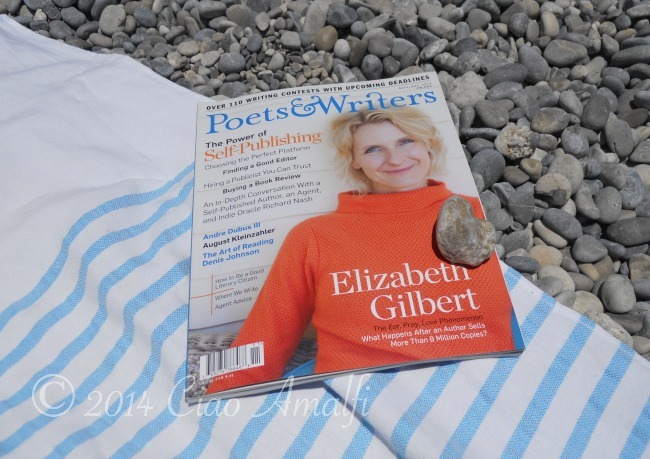 Yes, Elizabeth Gilbert to the rescue! This is a magazine that I bought in America last November. I guess I’m a little behind on my pleasure reading, but I enjoyed the interview. The cover matched my towel and swimsuit. That’s how I accessorize for the beach, yes siree! 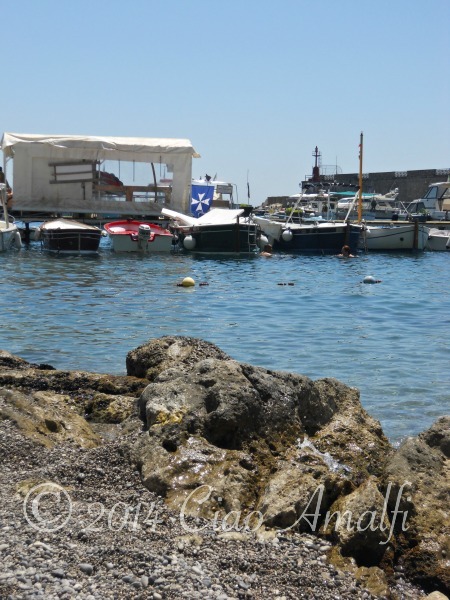 The small beach where we stopped in Amalfi is right in the port and is a free beach, which means you can just throw your towel down. It’s a popular beach with families, especially with very young kids or babies, since the access to the beach is down a gentle slop, the water is calm and the swimming area is small. Now that school is out for most kids this beach will be pretty crazy soon. But last weekend it was perfect for our first swim of the summer!